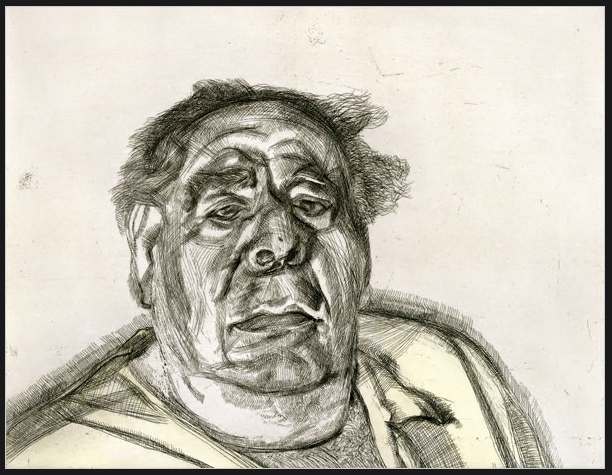 Lucian Freud (1922 – 2011) built his later reputation on the grossness of his images—unideal bodies flopping around in poses that most models, amateur or pro, wouldn’t take without being coaxed. Which they wouldn’t be, by most artists. But Freud’s in-you-faceness tends to blind us to the suave design and execution that tames his subjects, and makes them (or many of them, at any rate) engaging and even attractive. For example, the two figures above form a single warm, wriggly shape between the warm gray blanket and the cooler black screen. The light tones on their bodies are the bright focus of the composition. The center white is a centuries-old painter’s device; together with the frequent little sharp darks of the shadows that anchor the flesh tones and keep them from seeming soft or vague, it commands the eye and makes the slightly darker blanket seem full of action. The screen is a nice, simple, contrasting shape; the side bits of wall and floor make the space seem more “real,” less arty, than if the blanket were continued from side to side, which would make the artful posing of the figures more obvious. In sum, a masterful work with a strong decorative element. Similarly, the etching to the right, while going out of its way to emphasize Lord Goodman’s unheroic aspect, domesticates the subject by the power of its design. The shoulders swoop smoothly from left to right, forming one simple, stable mass that anchors the head. * Unity of head and shoulders is reinforced by the fuzzy margin that surrounds the shoulders and is repeated, more descriptively, in the hair. The head is very actively but abstractly rendered in jerky little shapes and shadows and odd, improbable brights that unite the face with the empty background. The background, sharp and coherent, is not a passive surround, but a positive shape pressing down on the figure. So: another masterful work with a strong decorative element. But in both of these examples, the tension between what is nice and what isn’t never goes away. That tension between order and disorder is a major preoccupation in Freud’s work. 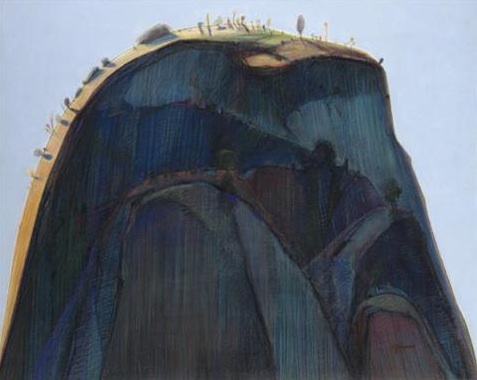 *As a sidelight, while the image consisting of a dominant mass is common in portraiture, it can be applied elsewhere—as in this landscape by Wayne Thiebaud.